Greetings and welcome to the first in a series of dispatches from the Third Space Network for our upcoming Art of the Networked Practice Online Symposium: March 29-31, 2018. We are excited to announce the next iteration of our unique, fully online Symposium: a three-day international gathering with keynotes, new creations of Internet performance works, and global roundtable discussions all accessible and participatory via the Internet from around the world. The 2018 Symposium is hosted by the School of Art, Design & Media at Nanyang Technological University (Singapore) along with our partners LASALLE College of the Arts (Singapore) & the School of the Art Institute of Chicago (SAIC), Department of Performance (US). A big thanks to Steve Dixon (LASALLE president) and Jon Cates and Roberto Sifuentes (SAIC Professors) for making this happen. The Art of the Networked Practice Online Symposium will have as its theme, “Social Broadcasting: An Unfinished Communications Revolution”: exploring the evolving shift from centralized one-to-many streaming and performance modalities to peer-to-peer interactions that creatively join artists and audiences in live, networked spaces. 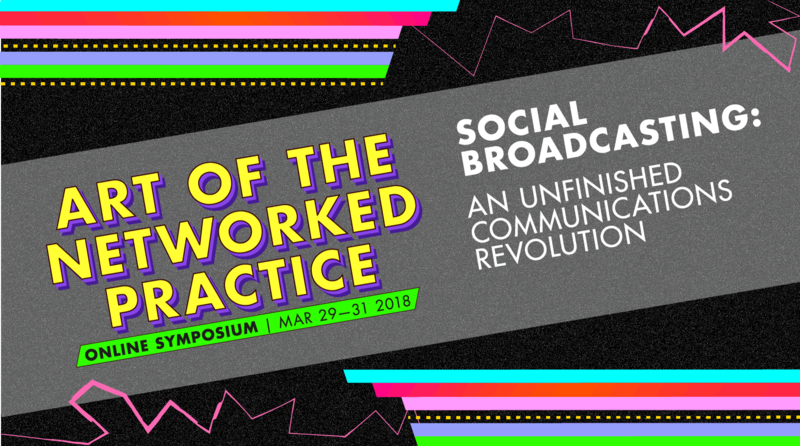 The Symposium agenda is inspired by Media historian and activist Gene Youngblood, who signals the need for “a communications revolution… an alternative social world” that decentralizes the broadcast through the creative work of collaborative communities. The Symposium program will include: (3/29) Being & Connectedness in Telematic Space with a keynote by online theater scholar Maria Chatzichristodoulou and a new Internet performance work by pioneering network artist Annie Abrahams and collaborators Antye Greie, Helen Varley Jamieson, Soyung Lee, Hương Ngô, Daniel Pinheiro, and Igor Štromajer; (3/30) Networking the Real and the Fictional, with a keynote featuring Blast Theory co-founder Matt Adams and a global roundtable discussion moderated by media scholar and performance artist Steve Dixon; (3/31) igaies (intimate glitches across internet errors), a new Internet performance work by Chicago “dirty new media” artist Jon Cates and collaborators Arcángel Constantini, Shawné Michaelain Holloway, Ei Jane Janet Lin, Paula Pinho Martins Nacif, and Roberto Sifuentes. We are also pleased to announce our new partner Digicult, a leading international online platform investigating the impact of digital technologies, which will collaborate with the Third Space Network in the online distribution and publishing of Symposium research, documentation, and essays. We look forward to working with Digicult founding director, critic, and curator Marco Mancuso. As with all Third Space Network events, the Art of the Networked Practice Online Symposium is free & open & accessible globally via Adobe Connect Web-conferencing, participatory for all attendees no matter where they are located. If you haven’t yet registered, please do so you can stay informed with upcoming dispatches, features, artist profiles, and announcements.